I love the snake yoga. It is so gentle and it takes me deep into my meditation. I give thanks to Le’ema for bringing it forth. 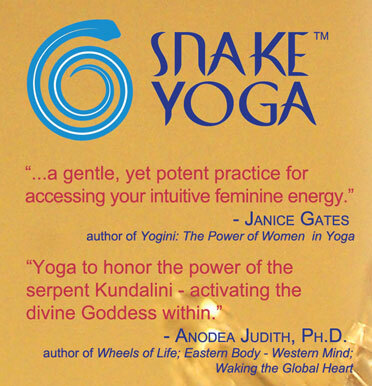 We recommend Snake Yoga in our office. Our patients are benefiting from this life-renewing practice. I find that the yoga postures in Le’ema’s Snake Yoga video assist my already developed yoga practice and add a sensual litheness to my dance. The colorful, aesthetic presentation is quite hypnotic and deepens my focus as I wind my way into the reptilian movements. This new take on yoga has enlivened my body awareness. A very gifted yoga teacher, Le’ema holds the space for the sacred feminine to emerge. A sublime experience. Leema’s style of teaching has all of the ingredients of a very skillflul and experienced teacher. She guides you through every movement with grace, wisdom and attention to the body, mind, spirit connection that truly facilitates healing. Le’ema Kathleen Graham has found her own unique expression of the ancient Snake Goddess and gives it form in this video… May her work bless and heal many women and men in the world who have as yet not awakened to the Sacred Serpent. Blessed Be! The Serpent in the Spine Meditation did more to boost my immune system in shedding my flu than an entire weekend of prescription meds! Your voice is sooooooo soothing, and I loved the macro-/microcosmic mandala of the serpent Self, spinning chakras and all! Chica, you sold me on this one!! Blessed be!! !